International Human Rights and peace activist receives Lions Humanitarian Award in Sydney. Internationally renowned environmental, peace, human rights and democracy activist, Wangari Maathai has been awarded the 2010 Lions Humanitarian Award in Sydney. 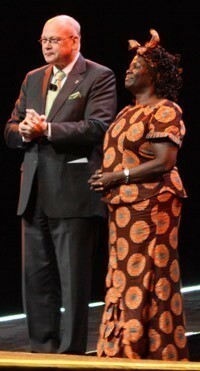 Maathai (pictured on left with Eberhard Wirfs, President, Lions International), who is from Kenya, became the first African woman to receive the Nobel Peace Prize in 2004. The Lions Humanitarian Award includes a grant of US$200,000 for continuing humanitarian work and was delivered as part of the 93rd Lions Club International Convention being held at the Sydney Entertainment Centre.More than 12,000 delegates from more than 140 countries are attending the event. Wangari Maathai is the founder of the Green Belt Movement, which is based in Kenya and is one of the most prominent women’s civil society organisations, advocating for human rights and supporting good governance and peaceful democratic change through the protection of the environment. Its mission is to empower communities worldwide to protect the environment and to promote good governance and cultures of peace. Maathai won the 2004 Nobel Peace Prize for her contribution to sustainable development, democracy and peace. Lions Clubs International is the world's largest service organisation with 1.3 million members in 45,000 clubs in 205 countries. Lions Australia is one of Australia’s largest service organisations with almost 28,000 members and 1,400 clubs across Australia. Lions Australia raises over $20 million each year to assist in community and health projects, and funding for Lions foundations and programs.